There’s no question that radial tires dominate the tire industry these days. Radials have become standard in the passenger car world, and radials are dominant with light trucks, heavy trucks, and just about every other tire market segment that sees highway use. Even though the pool of bias ply tires may be slowly shrinking, that doesn’t mean that they don’t have their advantages in certain situations. Let’s take a closer look at the differences between bias ply and radial tires, and the situations where one or the other will have the advantage. Before we dive into the advantages and disadvantages of each tire, it’s important to understand exactly what bias ply and radial means. Though both types of tires are round and hold air, but how they are constructed is very different. With a bias-ply tire, the individual cords that make up each ply or layer within the carcass of the tire run at an angle across the body of the tire from one bead to another. Though the angle varies, for the purposes of illustration let’s say they run at a 45-degree angle relative to the face of the tire. Additional plies within the tire run at opposing angles, or in bias, hence the term bias ply. The cords that make up the plies in a bias-ply tire are often made of nylon, rayon, polyester, or some other non-metallic material. There are typically multiple plies (layers) within the carcass of a bias ply tire, but the number of plies in the tread face is usually the same as the number of plies in the sidewall. The number of plies will have an impact on the load-carrying capacity of the tire as well as its resistance to impact breaks. A radial tire has cords that run straight across to each bead, perpendicular to the tread face, rather than running at an angle. Further, there are additional plies that run at an angle within the tread face of the tire only, so a radial tire might only have two layers within the sidewall but five or more in the tread face. Radial tires also usually have steel cords. A radial’s construction means it’s usually tough on the tread face but more vulnerable to impact breaks in the sidewall. With the basic understanding of bias and radial construction out of the way, let’s take a look at situations where each type of tire has an advantage. Due to their multiple layers, bias ply tires generally have the advantage when it comes to load-carrying capacity. Because there are a uniform number of plies to support the weight of a vehicle in both the tread face and the sidewall, bias ply tires are generally better when hauling heavy loads. This is why trailer tires, tractor tires, and heavy equipment tires are often bias ply; they can better support heavy loads. Radials are available with high load ratings, but the weight-carrying capacity requires adding many more plies to a radial tire, making them very stiff. Any tire manufacturer will tell you that the number one killer of a tire is heat. Heat is caused by several factors, including tire pressure, weight, and speed. As a tire rotates, the sidewall and tread face move, and this movement causes heat. The faster the speeds or the higher the weights, the faster a tire will heat up. A radial tire is better about dissipating heat than a bias ply tire for several reasons. It’s also worth noting that the higher the speed rating of the tire, the lower the weight rating. This is also why it’s a good idea to reduce speeds when towing with bias ply tires; a bias ply tire may last for years at 55 mph but fail at speeds of 80 mph simply because it can’t dissipate the additional heat created by the additional speed. Slow-speed, heavy applications like a full-size rockcrawler might actually do better with a bias ply tire than a high-speed radial intended for a trophy truck. This one might be controversial because the number of plies in a radial can vary quite a bit. Generally speaking, though, a radial tire has vulnerable sidewalls due to the reduced number of plies compared to an equivalent bias ply. Though there are several radials marketed to off-roaders with reinforced sidewalls opinion varies on whether or not most of them are truly as strong as a bias ply tire. Indeed, few people will argue that bias ply tires are capable of handling a lot of off-road abuse, while the strength of radial tires off the pavement varies quite a bit according to the manufacturer and the individual tire model. 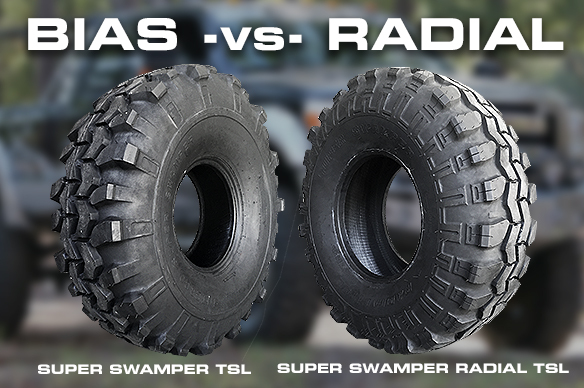 Sidewall failures are much more common on radials in an off-road environment, Puncture resistance is one of the biggest reasons that bias ply tires are the standard in agricultural, industrial, and slow-speed off-road applications. Related to puncture resistance, torque splitting (sometimes called “zippering”) should be a strong consideration for off-roaders. Though the term is not well known known, it refers to an injury further splitting or expanding under load. For example, let’s say there’s a puncture in the sidewall of a tire. Due to the multiple layers and construction of a bias-ply tire, that break in the sidewall will most likely be confined to the spot where the actual injury took place. With the construction of a radial tire, there’s a strong possibility that the site of the puncture will expand rapidly as torque and load is applied, resulting in a much larger tear or rip than the original puncture site. Why is this important? A puncture with a bias ply tire will most likely stay small, so it can be temporarily repaired with plugs out in the woods until a proper repair can be made. With a radial, there’s a much stronger chance that the site of the injury will result in a tear that will be well beyond what temporary plugs can handle, so you’re stuck without a spare tire. These tears can happen in the tread face as well, rendering a radial tire unrepairable when a bias ply could be repaired and returned to service. There’s no reason to sugar-coat it: radial tires outshine bias ply tires in everyday on-pavement ride and handling situations. Indeed, this is one of the big reasons that radial tires have become the standard in cars and light trucks since the early 1980s. A bias ply tire tends to follow ruts, cracks, and road irregularities, while a radial tire tends to skip over those same irregularities without transmitting them to the vehicle. Bias ply tires also flat-spot, meaning if the vehicle sits for a period of time, usually just overnight, flat spots develop in the section of tread in each tire was on the ground. The flat spots go away as the tire rolls and warms up, but this can make for a very uncomfortable driving experience for the first 15 minutes or so, especially if the vehicle has been sitting for several days. It should be noted that radials do flat-spot, especially when the vehicle sits for several days. Radials tend to flat spot less than a bias ply. For these reasons alone, radials are a better choice for daily drivers that see primarily street duty. Not all loads on a tire are straight down. In performance applications, tires see significant side loads as a vehicle moves through corners. The attributes that give a radial good overall pavement manners are the same ones that make them superior when it comes to handling abrupt corners, sweeping turns, and other performance maneuvers. A bias ply tire doesn’t respond as well to cornering forces, especially as the width of the sidewall increases. In straight-line handling there is little difference between a radial and a bias ply, but cornering performance varies significantly. Fortunately trucks shod with big tires aren’t expected to whip around corners like a sports car, so this is less of a concern in most off-road applications. But it’s worth noting that bias ply tires can make a vehicle feel lazy and less sure-footed during abrupt cornering maneuvers. Because there are fewer plies, especially in the sidewall, a radial tire is more forgiving and better about conforming to terrain irregularities, especially when tire pressure is lowered from the recommended specifications printed on the sidewall. Because of its additional sidewall layers, a bias ply tire tends to be stiff and less confirming. However, real-world off-road experience shows that simply lowering the air pressure of a bias ply tire a few more pounds than an equivalent radial will cause it to act much the same as a radial. And, because lowering tire pressure for additional off-road traction exposes the sidewall to more potentially damaging objects, a bias ply tire tends to be stronger and less likely to suffer a puncture. Most off-roaders will gladly exchange some extra stiffness for better cut resistance, since a flat tire isn’t much good to anybody. Bias ply tire construction also makes them better suited to more aggressive treads with wider voids between tread blocks, and these tread patterns can clean themselves out more easily than more tightly packed tread patterns with lugs closer together. Advantage: Radial - Note: Interco Tire offers the widest selection of bias ply LT tires on the market. 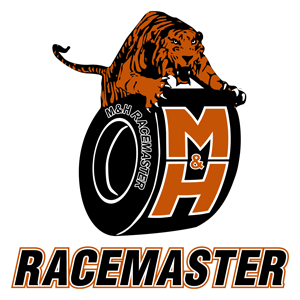 Because radial tires are so widespread, there is a much greater selection of radial tire sizes and styles available. Street tires, all-terrains, mud-terrains, and more are available in an enormous variety of sizes. With few exceptions, consumers usually don’t have many problems finding a tire for their needs in whatever reasonable tire size they desire. Bias ply tires for light trucks have become more of an enthusiast tire, with more limited tire sizes and styles available. The styles also tend to be on the more aggressive end of the spectrum, such as the Irok or the classic Super Swamper TSL. The selection evens out quite a bit with trailer tires (again, due to bias ply load-carrying capacity advantages), but most popular sizes are available in both bias and radial options. While tire selection may be limited, bias ply tires still rule the roost when it comes to really big sizes. It is difficult to manufacture a radial in very large sizes, so as a result, most tires above about 42 inches in diameter are going to be bias ply. If really big tires are part of your build plans, more than likely you are going to end up rolling on bias-ply tires. In today’s world it often seems as though radial tires are the clear-cut choice for any truck owner. While it’s true that a radial is generally a better choice for a vehicle that spends most of its time on the pavement, there are still some strong advantages to a bias ply tire when it comes to a vehicle that spends quite a bit of time off the pavement. In many ways, bias ply tires are arguably a better choice for pure off-road use, especially when you’re after the big, burly aggressive look. While there is no right or wrong answer to the radial vs. bias ply question, hopefully now there’s a better understanding of where each type of tire performs better so that consumers can make more educated buying decisions. Trenton McGee is the former technical editor of 4-Wheel & Off-Road Magazine, the former feature editor of 4x4 Power Magazine and the former host and co-producer of Superlift’s Off-Road Adventures TV show. He has written numerous articles for a number of automotive magazines and has published several popular 4x4 and general automotive reference books. 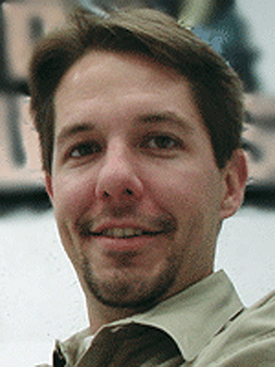 Trent is also an avid off-roader and consider among his peers to be an expert in and on the art of off-roading.